Most all modeling companies are private, not publicly traded, so it is difficult to determine if they are legit. Most of these companies do not offer important financial information on their websites or in their advertising, and too often they are not very forthcoming. Faced with a lack of information, consumers often wonder if a modeling company is legitimate. They have heard about a modeling agency, a modeling school, a modeling convention, or a modeling website, and they ask, "Is it legit?" One of the best ways to determine if a modeling company is legitimate is to study the federal government standards of legitimacy. In the past the Federal Trade Commission (FTC) has dealt with modeling companies which were not legitimate, charging them with deceptive and unfair trade. What are the federal government standards of legitimacy for modeling companies? What is the FTC Legitimacy Test? Reviewing three cases of FTC action against bogus modeling companies which were charged with Deceptive and Unfair Trade Practices, one basic test is clear. The FTC Legitimacy Test is a test of the company's success rate for return on investment. In dealing with the Model 1 modeling agency scam (FTC v. Model 1, Inc., et al), the FTC said one of the company's deceptive acts was "promising high-paying assignments"3 yet this claim was not backed up by their performance. They had a low success rate in getting models major modeling jobs. They were charged with "misrepresenting their ability to get lucrative job assignments for consumers as models and actors. "4 The firm screened potential models saying "the applicant can expect substantial pay as a model or actor, if accepted. "5 In fact, according to the FTC, consumers who completed the defendants' training program "seldom receive any paid employment. "6 They had an extremely high failure rate in two respects: the quality and quantity of jobs. What information did the FTC settlement with NTA require NTA to disclose? Their success rate. Pure and simple. NTA was required to inform consumers in advance of upfront fee payments how many children they placed in acting or modeling jobs, and how much they earned as a result of these jobs, basically provide the type of information needed to make an informed decision. Only 3.93% of those who paid NTA were paid by NTA! A miniscule fraction ever saw their money again. The scam company had particularly misrepresented two things: one, the chances of a child model who signed up and made payments getting paid work; and, two, the chances of the child models who did get work earning a large income. Essentially the FTC said it was deceptive of NTA to state or imply children would receive paying work or high-income work when very few did, and it was unfair of NTA to avoid disclosing their extreme failure rate to consumers before payment. Ultimately the FTC held a logical position: consumers have a right to know their chances of getting a return on their investment. What could be more simple or more important? The only fair and honest way to communicate this information is by providing statistics over several years for the number of models who received work through the company and the number who earned as much or more than they paid upfront. The most common false claims made by modeling companies are basic: 1) you will get work as a model, 2) you will earn a lot of money. The credibility test to investigate these claims has to be based on history, which is to say, the FTC Legitimacy Test. 1. How many models do you represent? 2. How many models whom you represent have received paying work? 3. How many models whom you represent who have received paying work earned more than they paid? The FTC Legitimacy Test applies to all kinds of modeling companies from modeling agencies to model managers to modeling conventions to modeling websites to modeling magazines and casting databases. Basically everything. The only way to project potential success and potential earnings and avoid wasting time and money is to look at the past. Does it work? For how many people? If parents had signed up their kids with NTA under the impression they could earn a lot of money, they may have thought they would earn at least $5,000. But over a period of five years, only seven children out of 18,414 earned more than $5,000 through NTA. Following the BBB's lead and finding out if a modeling agency (especially a new one) or a model search firm has landed anyone any work, is a good start, and it is good as far as it goes, but it does not go far enough. It is not enough to know the truth: you also need to know the whole truth. It is not sufficient to know that a modeling agency has a success story: you must know its success rate. And you should go still further, looking not only at how many models received work through a modeling agency or model search, if "any work" is defined as a "success," but the income from that work, because not all modeling jobs are of equal value. As the statistics for NTA above illustrate, there were far more low-paying modeling jobs available than high-income modeling jobs. It is wrong to assume most modeling jobs pay extremely well. Forget what you have heard, discard the few great success stories; look at the numbers: they are a reality check. In the case of work for children, for example, the vast majority (556/723) of those who made any money at all, earned less than $500, and only a few (3/723) earned over $10,000. On its face, if a modeling agency said, "We got 556 models modeling jobs," you might be impressed. If they said they all earned less than $500, you might be less impressed. Then if they told you those 556 were out of 18,414, you might well be less than impressed. What is your definition of success? Earning more than you invested? The president of a national modeling agency was confronted by the FTC Legitimacy Test. He boasted thousands of jobs being awarded to young models across America. He proclaimed over a million dollars paid out to models in one year alone. Then, to cut to the chase, he was asked the $64,000 Question: How many models whom you represent who have received paying work through your agency earned more than they paid? The question was asked because his firm sells photography and comp cards and seminars and so-called internet "exposure" for a grand total of over $1,000 before the models get their first audition. The conversation came to an abrupt halt. No answer. He was asked the bottom line questions several more times over several weeks and he still would not answer. It was well known that the type of work his agency found models paid low rates and it was long suspected most of the models did not recoup their investment. This is one basic clear example of how important it is to look beyond the fundamental issue of whether a modeling agency gets models work, or the agency gets thousands of jobs; that just does not tell the full story. So what if an agency gets thousands of models jobs each year? If they represent thousands of models or the payoff is so low per "modeling" job, the bottom line is no return on investment for the vast majority of models, and, more than likely, losses. Just do the math. If you only look at a few success stories and don't step back to see how many there are, you may not see the forest from the trees, and end up making a decision based on insufficient information that costs you dearly, and end up having to go to the FTC, a class action law firm, or small claims court to recover your money. Make no assumptions about the quantity of work or the quality of work a modeling agency gets models. Put it to the FTC Legitimacy Test. 1. "Bogus 'Talent Scouts' Use Smoke Screen To 'Screen Test' Consumers," Federal Trade Commission, Press Release, May 27, 1999. .
2. 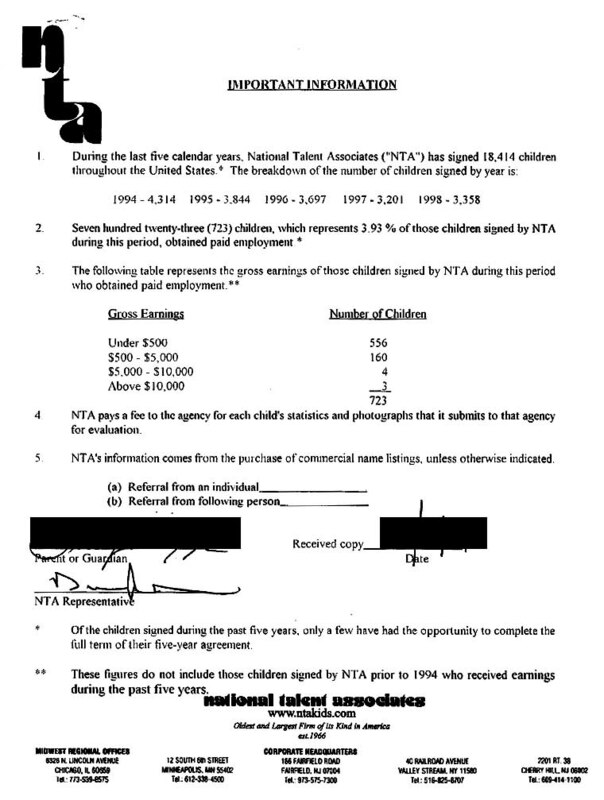 "Children's Talent Agency Charged With Deceptive Trade Practices," Attorney General Bob Butterworth News Release, May 27, 1999. (http://myfloridalegal.com/newsrel.nsf/0/EF731B19B390DC028525677E0066D26C?OpenDocument). 7. "National Talent Associates Inc.," Federal Trade Commission, Press Release, October 2, 1985. 8. "Not All Talent Scouts Behave Like Model Citizens," Vivian Marino, Los Angeles Times, October 26, 1994, p. 9. 9. "FTC Wins Permanent Injunction Against Talent Broker," Federal Trade Commission, Press Release, May 27, 1999. 10. BBB Reliability Report for Tomorrow Talent, (http://www.bbbnewyork.org/businessreports/Default.aspx?id=34786) [June 2, 2004]. 11. BBB Reliability Report for Model Search America, (http://www.bbbnewyork.org/businessreports/Default.aspx?id=35940) [June 2, 2004]. 13. North Carolina v. Face National Models and Talent LLC, ¶21. 15. Elisabeth Smith, Your Child As A Model (Stretham: Hollen Street Press, 1989), 32.